As a professional waste management company who operate in Sydney, let us take on all of your waste management needs. Businesses in Sydney can benefit greatly from our rubbish removal and waste management expertise. We undertake the removal and disposal of waste in many different areas of industry, and so we know exactly what is needed to ensure that the rubbish removal and waste disposal of a business, or a large household in some cases, runs smoothly. 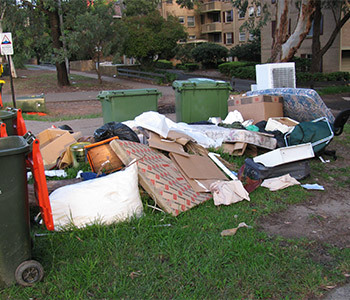 If you are looking for waste management in any areas of Sydney, then be sure to give us a call. As an experienced waste management company, we can look at the amount of waste you are producing as a business, and then cater our services to those needs. These services we deliver can consist of regular scheduled rubbish collections, as well as specialist collections for recyclable materials such as paper and cardboard, glass bottles, or green waste. Many businesses benefit greatly from having us manage the waste in their business completely. Just one of the major advantages of having a company such as us oversee your waste management, is that we undertake all the waste collection and removal services ourselves. We don’t need to out source any services, therefore we can keep costs down, as well as stay in complete control of how the services operate, being able to tweak them and reschedule collections where they are required. If you are a business looking for waste management in Sydney, be sure to get in touch with us via phone or email, we have a lot to offer as a large waste management company operating in Sydney.